Framed by her New York apartment doorway, Chantal Akerman is seen in her pyjamas tossing garbage into a plastic bag. 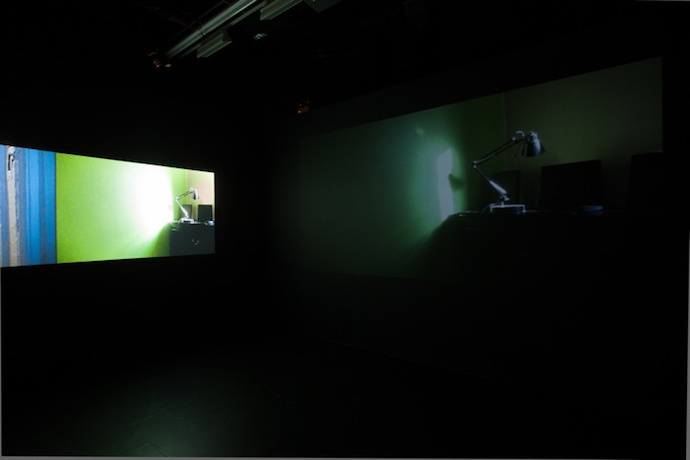 Such candid video fragments make up Akerman’s five-channel video installation Maniac Shadows (2013) which was on view at The Kitchen in New York earlier this year. Interjected with autobiographical images leaping one to the next without any pronounced thread, the videos show glimpses of the artist in a changing scenery of interiors and exteriors. In one scene, Akerman is observed cleaning up her living space while the 2008 Obama inauguration plays on the television. Meanwhile, another projection offers a darker representation of the quotidian and recounts her mother’s daily routine as she stares out the window of her Brussels’ apartment for what seems like eternity. This is followed by footage of a street party in New York which lasts late into the night where no one seems to notice the static camera. As older men dance, young boys ride their bikes in circles and young women walk around confidently among friends. These videos are consistently inconsistent and as such their installation together creates a sense of anxiety - distance between the characters projected, but also between the audience and the film-maker. The gaps left by a lack of linear progression or obvious narrative logic demand that viewers fill in the blanks and make their own associations. As scenes fold back upon themselves there is no distinction between inside and outside, visible and invisible, your interpretations or mine. 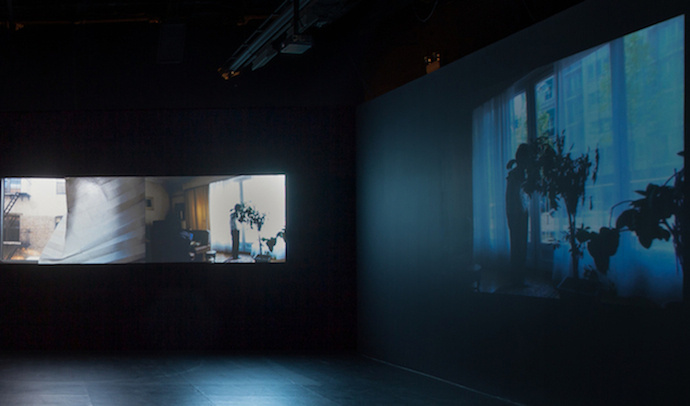 In the following interview, curator Alaina Claire Feldman talks to Chantal Akerman about working across film-making, installation and writing, and the making of Maniac Shadows. Alaina Claire Feldman: I was wondering what you know of the video-making of the militant feminist group Les Insomuses, and the work of Delphine Seyrig in particular? Seyrig directed Sois belle et tais-toi (Be Pretty and Shut Up, 1981) which featured a series of interviews about the film industry with well-known actresses, including Jane Fonda and Anne Wiazemsky. She shot the film in 1976 around the same time that you were working on your arguably most popular film, Jeanne Dielman, in 1975. Chantal Akerman: Yes, of course everybody knew that. ACF: Did you learn about her activities directly from her? CA: I knew about them from her, and from other people. She was a real feminist. Organising abortions in her own apartment... helping prostitutes… and she’d talk about it. If you watch the DVD collection of my work that was put out by Criterion,1 there’s one piece where she talks all about that. ACF: Sois belle et tais-toi allowed actresses to speak candidly about what was expected of them by the film industry in the 1970s. From your first film, Saute ma ville (Blow up my City, 1968) to your recent installation at The Kitchen, you’re usually both the main protagonist performing as well as the film-maker, in full control of your own image. CA: But you know it’s not really performing what I’m doing. CA: No. For me it’s not about the individual scenes with me doing things but rather the whole piece. I’m not going to speak about myself in the piece, that’s not very interesting. For me the whole piece is like throwing a stone into the river and then creating ripples and ripples and ripples and ripples... And those ripples are the shadows that you see on the left and right side of the video. And when you see me reading in one of the works, it’s because the whole thing is related to a book I was writing while I made the installation. CA: Yes, this is the third book. But you know I was not making a film here, I was making an installation. ACF: How did the shift to making installations come about? CA: I did not shift. I do films. I do writings. I do installations. I do whatever pleases me at the moment. I was already writing when I was very young, younger than 15, and then I saw Jean-Luc Godard's Pierrot le Fou (1965). I realised film can be poetic, not like the commercial films I was used to seeing. Then in the 1990s, Kathy Halbreich asked me to make an installation at the Walker Art Museum. At the time I didn't even know what an installation was; it was just another opportunity to make a film. I wanted to make a film about the East of Europe but I had no news from the museum so I decided to start the project myself. And then they came up with the money to make the installation [D'Est, 1993, 25 channel video installation, 16mm film, colour, sound]. So it happened in a way by chance. And then it was such a pleasure to discover something else; it was much more free than making a movie. ACF: And much more solitary. Because you lack the production, editing and sound, so maybe the process is closer to writing in that sense. CA: Yes, I don't like huge crews at all and what I like about writing is that it's just me and my page. With installation pieces it’s just me and my editor. We play with the image and try to make something, not something that makes immediate sense, but gives a feeling. ACF: Are the people who see your films the same audience that visits your installations? Do you think about your audience while making these works? CA: Audience does not concern me. Of course I like it when people show up! I think the border between the people who see my films and the border between the art world is not so large. It can be the same people, but I can’t be sure, I don’t stay to see who is coming. ACF: Do art installations allow you do something you can't do with film? CA: Yes. You can play with the physical space and the experience of time is very different, except when it’s just one track. For example, I have made a film called Là-bas (Over there, 2006); each time it goes to a gallery they say, ‘Well, that's an installation’ and I say, ‘No, it’s a film’. I guess it could have been an installation too. ACF: You are one of the first film-makers to successfully position yourself in a contemporary art context. When you put something in an art space, the life of that work becomes very different. A film can be screened many different times, it can be bought as a DVD or distributed and downloaded and watched at home. With an art installation it’s only visible during the duration of that particular show. It has a very short horizon compared to a film. Does that change the way you consider the works you make for the screen or the gallery? CA: My installation will be up for one month at The Kitchen. My films will show for one week in New York! And films were not made for watching on your computer. They were made for the big screen, in a theatre. But sadly all the theatres my films are made for are disappearing. Now they're all for blockbuster movies so I guess people are becoming familiar with watching them more on the computer. ACF: Words like ‘mania’ and ‘hysteria’ are associated with attempts to pigeonhole women who rejected normative feminine behaviors. The frenzied way in which the video in the centre of Maniac Shadows jumps from scene to scene might be said to mimic manic behavior. One moment we are looking out of the window of a country house, then we see a block party in Manhattan, then your mother waiting by her apartment window. CA: I made this when I was in a bit of a maniac phase. And since there are a lot of shadows I called it Maniac Shadows. The other work I made in this series is called Maniac Summer (filmed in Paris in 2009) because I made it in the summer when I was in a maniac phase. I can't say anything else about that. ACF: Does sense of place matter here? Where was the work shot? CA: It’s all over, it doesn't matter where. The point is that it’s all over the place. In Brussels, in Oklahoma, in Cape Cod, in New York, Boston... I’m not the one to give you information about this – you have to decide what you feel and what you see there. This work is about a lot of things. Like I said, it’s a stone that you throw in the water and you see the ripples and the shadows. Everybody has a different reaction but in one way or another everyone can relate to the things they see here. On Wednesday 25 June 2014, as part of the exhibition ‘Cherchez la Femme’ at SPACE, London Alaina Claire Feldman will discuss the pioneering work of 1970s French feminist video collectives with Nicole Fernández Ferrer of the Centre audiovisuel Simone de Beauvoir, Paris.